on my Facebook status. It got noticed as “celebrity” always does and one person remarked “hanging with the superstars”. I commented back saying that they were all “superstars”. Certainly, Captain Paul Moulds for the work that we devotes himself to with Oasis and reaching out to homeless youth in Australia and Sir Richard Branson for his generous support and making it possible. But perhaps the biggest “superstar” is Damien, the young man in the middle who turned his life around from being on the streets with barely any hopes and dreams at all to having a job, a place to live and a bright future. I was attending an event yesterday at Oasis where Branson was cutting the ribbon on the opening of a fitness center that his company Virgin had funded. 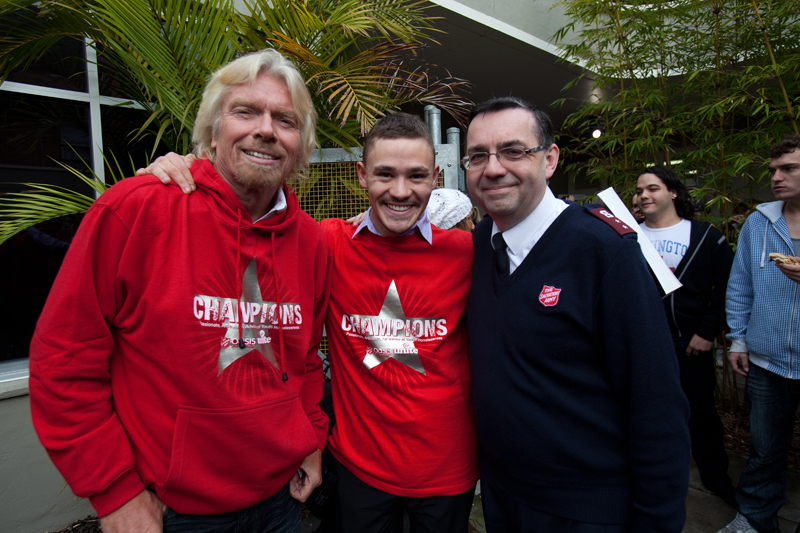 But prior to the opening of the center, Branson and others listened to the stories of the “champions”, young people like Damien who against all odds, had redirected their lives to a better future. The stories were difficult to hear – stories about being abused – physically, sexually and emotionally. Stories about wanting to die and the attempts that they made on their lives because they felt unwanted and that they had no purpose. I can’t even begin to really understand the horrors that these kids have faced in their young lives. I can’t even imagine how difficult it was for them to tell their stories, and yet they did so with grace, dignity and compassion for one another. They were there for each other and to show their gratitude to people like Paul Moulds and Richard Branson who make places like Oasis possible. One young man said – “without Oasis, I’d be dead”. I will never forget that morning and it went far and beyond the thrill of meeting Sir Richard Branson and eating an egg sandwich that he had cooked on the grill. The most important thing I walked away from was being around a group of people with a like-minded purpose. A purpose of doing whatever they can to make a difference – a positive difference in the world. I could see, hear and feel the impact that Moulds and Branson had made in these young people’s lives. It was tangible and real – not just words on the pages of a foundation’s annual report. As we wind up our time in Australia and head home for a few days break before heading down to South America, I am energized by something that Paul had mentioned during his interview. He was talking about an amazing documentary that was made about Oasis and the issues facing homeless youth in Australia. The documentary was two years in the making and gave an up close look into life on the street for these young people. Paul told me that after the documentary aired on Australian TV, the response and support that followed was astounding. It had made a real impact and prompted people into action – to help with donations or wanting to volunteer. So I’m energized going forward that our little film will also create awareness and prompt others into action and what they can do to make a positive difference in the world. It’s a simple yet powerful thought and full of possibility – the power that’s within all of us to create change and make the world a better place for those that are less fortunate. The power of possibility – think about it. This entry was posted in Uncategorized and tagged around the world, Australia, community, extraordinary people, helping others, inspiration, journey, Oasis, Paul Moulds, People Making a Difference, philanthrophy, Richard Branson, round the world travel, Travel, traveling abroad, volunteers. Bookmark the permalink. Amen. Awesome inspirations! I have always admired Sir Branson. I would like to tap into that; for myself (not a youth0 and to be able to help others.